Kansas City Public Schools, as well as other school districts, showed marked improvements on the Annual Progress Report (APR) released by the Missouri Dept. of Elementary and Secondary Education (DESE). KCPS earned 82.9 percent of the points possible on its 2018 Annual Progress Report, according to data shared during a press conference today at Woodland Early Learning Community School. The district celebrated as a remarkable turn-around for a school system that faced a potential state takeover just a few years ago. Every year, DESE produces an APR that measures improvement based on several different factors for every public school and Local Education Agency (school district) in the state. These performance factors include, among other elements, Missouri Assessment Program and End-of-Course exam results, attendance and graduation rates, and career and college readiness. APR points are accumulated for achievement and improvement in each category. School districts are expected to get at least 70 percent of the possible points in order to be considered at a “full accreditation” level. State accreditation status is determined by a vote of the Missouri State Board of Education, which considers APR and DESE recommendations when making this decision. After losing provisional accreditation in 2011, KCPS earned that status back from the state school board in 2014. Since then, the school system has been steadily gaining ground under the leadership of Superintendent Mark Bedell. During his remarks at the Feb. 1 press conference, Dr. Bedell credited the support of the School Board, previous superintendents, staff, students, families, elected officials and partners. Dr. Bedell highlighted three particular points of pride for KCPS in the 2018 APR results. First, KCPS students performed better than they ever have in recent memory on state exams in math and English language arts, earning 15 out of 16 points. 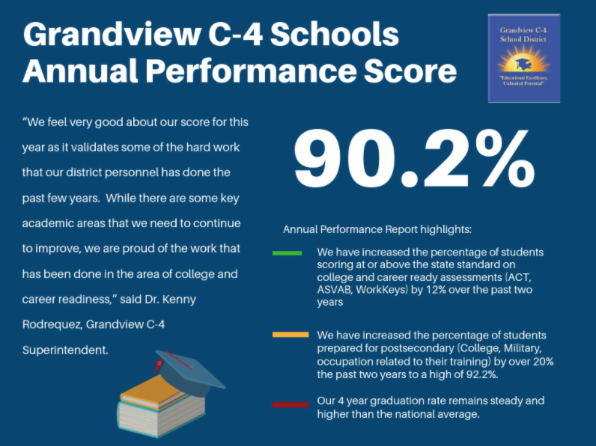 Second, KCPS is either at or on track to reach state goals for 2020 in all three College and Career Readiness expectations: 6 out of 10 points in assessments, which includes the ACT, SAT, ASVAB and ACT WorkKeys exams; 9.5 out of 10 points in Advanced Placement; and 10 out of 10 in Post-Secondary Placement. Third, KCPS earned 24 out of 30 points for its graduation rate. The five-, six- and seven-year graduation rates are all on pace to meet state expectations by 2020. All Missouri school districts received their Annual Progress Report scores and generally reported improvements from the prior year. In general, the seven school districts LINC partners with showed improved scores. One general area where the district showed low scores was in student attendance. Here’s more detailed information published my some of the school districts. 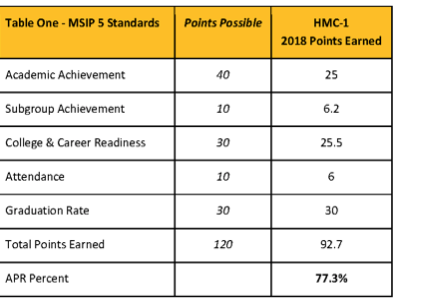 The Hickman Mills School District received its highest percentage in five years with a score of 77%, putting the district on track to regain full accreditation. The substantial growth is the result of several factors including an increase in points earned in mathematics.